The term “living legend” is often bandied around far too easily these days, but for Johnny Marr, shouldering that weight of expectation has seemingly been no problem at all. For time and again over the years, Johnny Marr has proved himself as a sharply dressed, guitar legend par excellence, be it as Morrissey’s multi talented songwriting partner in The Smiths, Bernard Sumner’s canny right hand man in Electronic, the charismatic, superstar player added to the ranks of The The, The Cribs and Modest Mouse or the super sought after studio collaborator who has successfully worked with the likes of Talking Heads, Hans Zimmer and Bryan Ferry. Now, with his accomplished brand new album Call The Comet scaling new heights of musical distinction, Marr can proudly add the richly deserved label of “solo artist to be reckoned with” to his glittering repertoire, no mean feat – as a lot of guitarists striking out on their own can attest to. 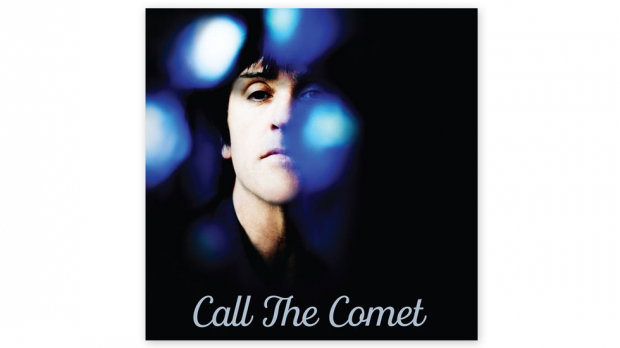 Recorded with his band at his very own Crazy Face Studios in his hometown of Manchester, Call The Comet is Marr’s third solo effort and one that follows his critically acclaimed previous two albums – 2013’s The Messenger and 2014’s Playland – in irresistible fashion. Set in the not-too-distant future, Marr has imagined the idea of an alternative society, his own magic realism where one Donald Trump and Brexit don’t exist and where the characters in the songs are searching for a new kind of idealism. Over the course of 12 songs and 57 exhilarating minutes, Call The Comet blasts forth like the urgent clarion call of a man thoroughly enjoying the process of “embracing his emotions, politics and his signature guitar sound.” To nick a tidy quote from The Independent in the UK – that “signature guitar sound” is something that the forward-looking musician had always been at pains to play down over the years in an over cautious bid to avoid being seen to be playing it safe and living off the past. While Johnny Marr isn’t one to rest on his laurels, it’s certainly good to see him back on familiar, guitar laden ground. After all, Johnny Marr rocking out on the guitar? Surely that’s what the punters have shelled out their hard earned cash to hear. Drawing inspiration from his formative musical influences – classic post-punk bands like Joy Division, Magazine, Buzzcocks and Wire – Marr has returned to the iconic, multi layered “guitarchestra” sound that that everyone identifies him with on Call The Comet. And by doing so, he has crafted his most confident sounding solo album to date. The first three songs on Call The Comet – early U2 soundalike Rise, rumbling lead single The Tracers and the monitor straddling Hey Angel – kicks the album off on the front foot and are enjoyable, strutting post-punk thumpers purpose built for sending the front row into throws of ecstasy at sweaty gigs. The shimmeringly brilliant single Hi Hello is the album’s standout track and Marr’s best solo track to date by a country mile with its chiming guitars and melancholic strings. So good is the track that it could even be a missing part of The Smiths’ canon, a long lost cousin of Morrissey and Marr’s There Is A Light That Never Goes Out if you will. It’s one to listen to on repeat play, the song is that kind of special. Marr’s enduring love of classic post-punk is evident all throughout Call The Comet, from the early Cure soundalike My Eternal with its mechanical, gothic vibes to Spiral Cities, a sky scraping anthem already established as a firm favourite in Marr’s live shows which borrows its chord sequence from the New Gold Dream era Simple Minds track Someone Somewhere In Summertime and its flamboyant guitar stylings from supremely talented early Siouxsie and The Banshees guitarist John McGeoch. Elsewhere, tracks like New Dominions, Bug and Actor Attractor finds Marr exploring experimental territory, propelled forward by some colourful guitar arrangements and retro futurist sounds. With Call The Comet, the evergreen guitarists’ guitar player has delivered his best solo album thus far. “If it ain’t broke, don’t fix it” goes the old cliche, and it sums up Marr’s songwriting and sonic approach on Call The Comet down to a tee as the whole album is very much the sound of the artist playing to his strengths. If one has to nit pick then Marr’s slightly overproduced vocals could have done with a bit less on the effects side but minor quibbles aside, the end result is the finest guitar record that Johnny Marr has been involved with since his days with The Smiths.